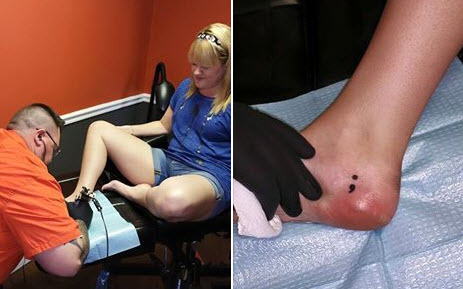 Last year, I got a semicolon tattooed on my inner ankle. A semicolon symbolizes a sentence you could have ended but choose not to. The reason I got this tattoo was to remind myself that I'm part of a huge community of people that are going through the same thing. It's my badge of pride for getting through everyday and a reminder from my healthy self when I'm having a panic attack that this feeling won't last. A few months later I got a tattoo of the words "Love Always" on the side of my foot." Love" is in my dad's handwriting and "always" is in my mom's. I got this because, when I'm having a panic attack, I feel alone and like no one loves me. At times like this, this serves as a reminder that, no matter what happens, I know there are two people who will always love me. That's what I love about tattoos (to my parents' dismay) -- that it can serve as a reminder that you carry around with you everyday. For me, it's a reminder to be strong, to survive, and that things will get better. It's a reminder that I am not alone. Model/Actor/Director Travis Deslaurier has a tattoo on his upper arm that reads "That which does not kill me makes me stronger" and a tattoo on his forearm that says "Time to shine," which he got when he felt he needed to change his life. He said this about tattoos: “Tattoos means a lot to me. I had a really tough upbringing. … I was struggling with depression. ... Tattoos helped me get through that. It helped me repair myself through all the struggles of life. … It’s like being reborn again." In spite of all these challenges in the mental health marketplace, there are specific business strategies and approaches practitioners can adopt in an effort to overcome these obstacles and ultimately triumph in the profession. As a result, our first step here is to acknowledge and accept that sales are a critical part of the process in the mental health business.